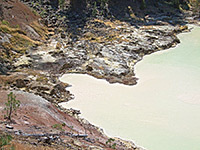 There are two thermal areas in the Warner Valley region at the southeast of Lassen Volcanic National Park - Devils Kitchen, a colorful collection of small, steaming vents, and Boiling Springs Lake, the largest single active feature in the whole park and one of the biggest hot lakes anywhere in the world. 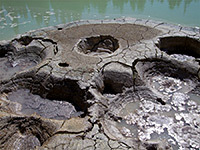 Set in forested land on the south side of the valley, the lake is 500 feet wide, surrounded by a ring of mudpots and fumaroles, and filled with cloudy, greenish, acidic water that constantly bubbles and fizzes. The lake sits a bowl-shaped depression, enclosed on most sides by steep slopes that prevent easy access to the waters edge, though several NPS notices warn against trying to get too close because of the unstable ground and boiling subterranean water. A loop path circles the whole site, generally staying 100 feet or more from the lakeshore, and the main trail continues another 2 miles through the forest to Terminal Geyser, a recently created vent believed to result from some drilling operations nearby. Boiling Springs Lake is the more interesting destination, however, and is reached by an easy trail of 0.8 mile, though few people visit this section of the park. Boiling Springs Lake topographic map, Lassen Volcanic National Park map. 7 views of Boiling Springs Lake. Features of Boiling Springs Lake (mp4; 0:56 min; 14 mb). The signposted trailhead for Boiling Springs Lake is along the unpaved section of the Warner Valley Road, 1/3 mile before it ends at Drakesbad Guest Ranch. From the small parking area, the trail (actually part of the 2,650 mile Pacific Crest Trail) enters thick undergrowth beside Hot Springs Creek, follows the stream a way, crosses it on a footbridge and climbs the hill on the south side to a junction. Turning left (right is to Devils Kitchen) then left again soon after (right is to Drake Lake), the path ascends some more, not too steeply, crossing some open areas but mostly through a mature forest of tall, well separated fir, ponderosa pine and incense cedar trees. There is one more junction, with the return part of the loop trail, before the path arrives at the north edge of the lake. 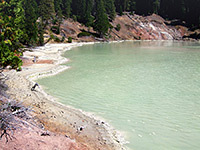 The earth around the edge of Boiling Springs Lake is colored variously red, pink, yellow, grey and white owing to underground activity, and is largely free of vegetation. Dozens of vents and pools are spread all around the shore, the majority rather small and not very spectacular. The activity level lessens during summer as the water levels drop, though the lake itself is permanently simmering in a few locations and maintains a year round temperature of 125°F. The thermal features are not easy to see close up because the path stays quite high above, circling the crater rim at the edge of the forest for half a mile. Despite the cautionary notices, fainter, hiker-made paths do descend to the lakeside in a few places, winding past some of the sulfurous vents. At the northwest corner of the lake, an alternative exit trail crosses the (usually dry) drainage channel and rejoins the main route a little way north, while the continuation route to Terminal Geyser branches off at the south side of the lake, follows a shallow ravine to a ridge then descends a little to the steaming vent, located at the head of a bouldery ravine.